Would you know if your cat is dehydrated? Dehydration in cats is a state in which your pet loses his body fluids. One of the most terrifying things about dehydration is that it is rarely apparent. Most cats can live with constant under-hydration for years without their owners even knowing it. In this article, you will learn how to find out if your cat may suffer from dehydration. 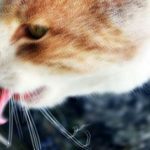 You will also learn how to perform a very quick test to assess your cat’s hydration level at home, how to recognize cat dehydration signs, and what steps should be taken if you suspect dehydration in your cat. Do you suspect that your cat may be dehydrated? 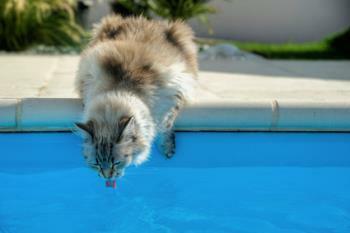 Here are some possible causes of dehydration in cats. Diarrhea. If your cat has diarrhea for more than a day, then it’s guaranteed – he is dehydrated. Diarrhea is associated with extreme fluid loss, which your cat cannot replace with natural intake. What does this mean? If your cat has diarrhea for a day, he’ll regain the fluids over the next few days, after returning to normal passage and water consumption. 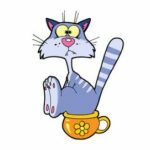 If, however, your cat has diarrhea for a prolonged period of time, then not only do you need to treat the diarrhea itself, but you will need to administer extra fluids, as well. Other medical causes. Certain medical conditions, such as increased urination, drooling, urinary tract obstruction, and heatstroke, can also bring dehydration. Of course, you should never attempt to treat these conditions at home. Your veterinarian will help, not only by taking care of the primary condition, but also by assessing the need to administer fluids as a treatment for dehydration. The cat is not drinking water often enough, or he is drinking too little. This usually occurs for two reasons. The cat may be finicky about water, or, more commonly, fresh drinking water is not always accessible. Normally, an average-sized cat requires 0.2 to 0.3 liters (8 to 10 oz.) of water every day. Depending on the type of food he eats, he may get some of this in his food, especially if he’s on a canned-food diet. Remember, if your cat is drinking too little, this will become an emergency very quickly. If your cat does not eat or drink for more than a day, his internal organs may be permanently damaged. The cat is eating dry food. If your cat eats dry food, he intakes only 40 ml of water with food per day (very rough estimate for a cat that weighs 4 kg). Given that he needs approximately 200 ml of water every day, he still needs to drink 160 ml of water. That is a lot – make your measurements. We doubt your cat will get even close to enough. Eating exclusively dry food is a common cause of dehydration in cats. If you suspect your cat may be suffering from dehydration, you can look for the signs and perform some tests to check if your cat is all right. Just as in human medicine, the skin turgor test is the most popular way to assess your cat’s hydration level. Basically, it checks the elasticity of the skin. If the skin is not elastic, it contains too little fluid. Grab your cat’s skin above his shoulder blades on his back. Gently pull the skin up and release it. Note how fast the skin springs back. Normally, it should regain its previous form immediately (in a less than a second). However, if it takes longer, then your cat is under-hydrated. The more slowly it retracts, the more severe the dehydration. Depending on how much fluid your cat has lost, dehydration may be characterized as mild, moderate, or severe. This is similar with humans. 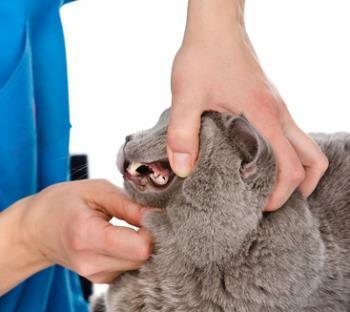 Check your cat’s gums for moisture and capillary refill time. 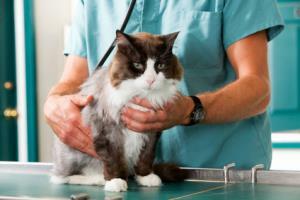 A capillary refill time test lets you assess your cat’s blood circulation. Bad blood circulation can suggest certain health disorders in your cat, such as dehydration and shock. If you know for sure that your cat is not in shock (he is not if he responds to anything around him) or having a heart attack, you can use a capillary refill test reliably to assess his hydration status. Push your finger against the gums in your cat’s mouth. Though you should avoid causing any pain, you must push hard enough to clamp the capillaries. Keep pushing for a few seconds and then release. You should now see a white dot where your finger was pressed against the gums. Note the time it takes for the dot to disappear. Normally, it should take one to two seconds. If it takes longer, your cat may be in trouble. Capillary refill time is not the only thing you can check once you have managed to put your finger inside your cat’s mouth. Also check if your cat’s gums are moist and slippery. If they are rather sticky, this is a definite sign that your cat is dehydrated. You should also look for other symptoms, like hard stool and constipation, sunken eyes, loss of appetite, lack of activities, dry skin, and flaky coat. Note that there may be many other reasons for these symptoms, but any of these is a good reason to visit a veterinarian. What to do for a dehydrated cat? So first, you realized that your cat’s lifestyle provided at least one prerequisite for dehydration. Then, you noticed some signs of dehydration and did some tests to assess your cat’s hydration level. What comes next, after you have confirmed that your cat may be under-hydrated? If your cat is dehydrated – visit a vet! Visit your veterinarian. This must happen as soon as possible! Dehydration can have serious consequences quite rapidly. Besides, if your cat is low on fluids, forcing him to drink more may not be enough. His body fluids may need to be replenished by a healthcare professional. Switch to a wet diet. Dry food contains no more than 10% moisture, while canned and raw cat diets contain up to 80%. Are you just wasting your money buying water in a can, then? Nope. You are buying health for your cat. By nature, cats drink very little, and they get most of their water through their food. If his food contains an insignificant amount of water, a cat will be under-hydrated, no matter how much he drinks. Encourage your cat to drink more. Even though cats drink very little by nature, this does not mean they should not drink at all. Fresh water should always be available in several places around your home. Be sure to keep the water bowls away from food bowls and litter boxes, as well as from potentially frightening objects, like washing machines or vacuum cleaners. You might also consider getting a pet fountain, since cats love running water. Here are other ways to encourage your cat to drink more. The sad fact about dehydration in cats is that it’s never that apparent before it reaches a crucial level. If you know the preconditions and the signs, then you will always know when to run a quick test to make sure that your cat is okay. 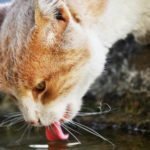 How much water should your cat drink per day? Should you be worried if your cat has diarrhea? Do you pay attention to how much water your cat drinks?